Villa Capra "La Rotonda" in Vicenza - the classic "Palladian Villa"
A variation of the Roman villa ideal developed on the mainland of the Venetian republic in the 16 C and 17 C, partly driven by noble families improving their estates, The villa designs in the Veneto reflect Renaissance ideas promoted by humanist scholars and illustrated in the pages of architectural treatises printed in Venice by Italy's most prolific presses. The 1511 edition of Vitruvius' De architectura, prepared by the Franciscan friar and architect Giovanni Giocondo da Verona (ca. 1433–1515), added woodblock pictures of ancient buildings to illustrate the notoriously difficult first-century B.C. text. With nearly equal importance given to words and pictures, Sebastiano Serlio (1475–1554) amended ancient models with contemporary Roman examples in his books Regole generali di architettura (1537) and Il terzo libro de le Antiquita (1540), the first two published volumes of his multivolume treatise. Serlio described the fresco perspective views at the Villa Farnesina (1509–11) as the extension of the interior space into the landscape, and he highlighted the siting of the Villa Madama "amongst all the elements required for pleasure." Vincenzo Scamozzi's L'idea della architettura universale (1615) recorded the rebirth of the ancient Roman texts and the unity of geometry and proportion within architecture. The most prominent of the Venetian humanist-architects to claim the heritage of ancient Rome was Andrea Palladio (born Andrea di Pietro della Gondola), who promoted the antique tradition of his activity in I quattro libri dell'architettura (1570). 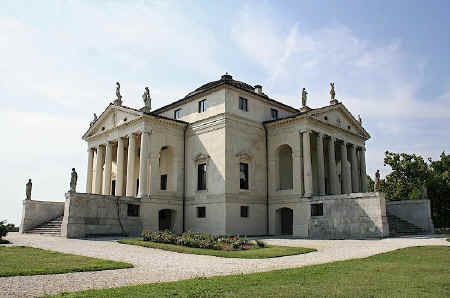 Palladio mastered a formula of the ideal villa as a type. In his design methodology, he united the humanist understanding of otium with a repeating set of architectural rules governed by his reinterpretation of principles of proportion from ancient Roman precedent. Palladio's villa designs are typically organised with symmetrical plans and incorporating the antique temple front as a portico. Notable examples include the Villa Barbaro at Maser (1557–58) and the Villa Almerico-Capra - La Rotunda, near Vicenza (1566–69). These two buildings demonstrate Palladio's ability to design a versatile range of villa elements with extended rectangular shapes and square block forms. At the Villa Barbaro, the solid walls transform into a loggia, a painted representation drawing the natural surroundings into the central hall, or sala, with allegorical depictions of the seasons and scenes from contemporary villa life executed in 1561 by Paolo Veronese (1528–1588). In Palladio's design for the Villa Almerico-Capra, four identical porticos with temple-fronts and broad rising staircases are arrayed symmetrically on perpendicular axes about a circular sala at the centre of the building. The villa is advantageously placed on a hilltop and dominates the landscape when viewed across the fields. Palladio's invention parallels the unusual combination of forms at the Villa Adriana in Rome, as he crowns the building with a dome recalling the ancient Roman example of the Pantheon.